The NASA P-3B and DC-8 airborne laboratories are the workhorses of Operation IceBridge. These aircraft house several sophisticated instruments for measuring snow depth, ice elevation and thickness, surface temperature, bed topography and other characteristics of sea ice, ice sheets and glaciers. The airborne laboratories have been joined by other aircraft, such as NASA’s King Air B-200 and HU-25C Falcon, the Gulfstream G-V owned by the National Science Foundation and operated by NCAR’s Research Aviation Facility, the University of Texas Institute for Geophysics’ (UTIG) chartered Kenn Borek Basler BT-67, and a variety of small planes used by researchers from the University of Alaska-Fairbanks (UAF). These aircraft increase the number of instruments IceBridge can field at one time, greatly expand the geographic area covered and add a higher-altitude perspective on polar ice. Laser altimeters are the primary instruments on both NASA’s previous ice-monitoring satellite ICESat (GLAS) and the upcoming ICESat-2 (ATLAS). Laser altimeters are used by IceBridge scientists to measure changes in ice elevation and by using these instruments, IceBridge is able to continue ICESat’s record of measurements and will validate and calibrate readings by ICESat-2 in the future. NASA uses two laser altimeters, one optimized for low altitude and one for medium altitude. UTIG and UAF also use laser altimeters of their own. The University of Kansas’s Center for Remote Sensing of Ice Sheets (CReSIS) operates a variety of radar instruments on the IceBridge P-3B and DC-8 airborne laboratories. Each of these instruments uses a different frequency band, which gives them the ability to examine the entire ice column, ranging from the surface, through accumulated snow and all the way down to the bedrock below. University of Texas Institute for Geophysics’ (UTIG) also operates a radar instrument that flies on their aircraft. Optical imagery and infrared measurements can be obtained through a number of different instruments depending upon airborne platform, other instruments flown and geographic areas being measured. 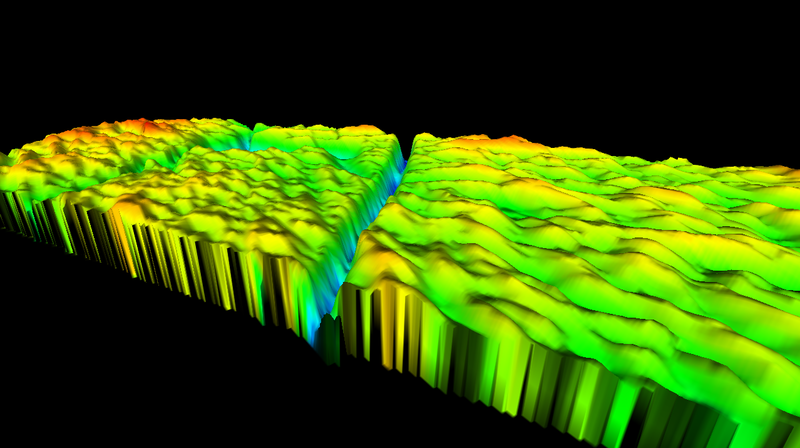 Additional IceBridge instruments allow researchers to create detailed photographic maps of polar ice. 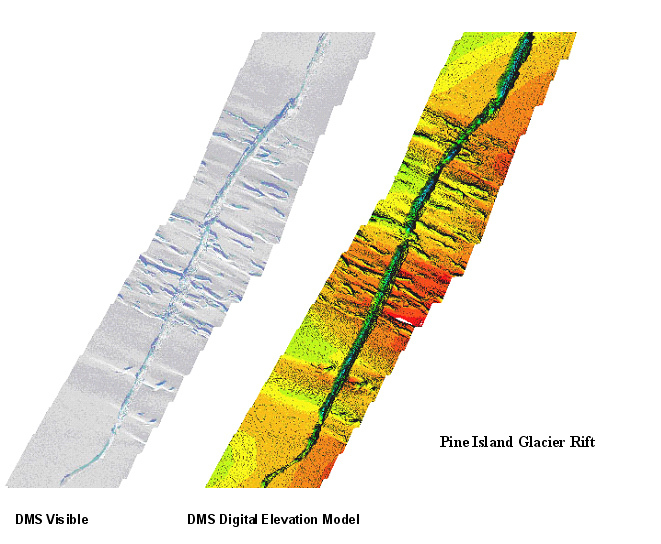 Image mosaics from the DMS and CAMBOT system are used in a variety of ways and temperature data from the FLIR imager and KT-19 sensor can detect openings in sea ice even in the dark. and measure the temperature of the surface below. The gravimeter and magnetometer, managed by Columbia University, are used together to locate the bed where radar cannot see it, this is usually where the ice is floating as radar is unable to image through water. The interpretation of the gravity data relies on knowledge of the geology that makes up the bed.